There are many ways to approach getting a multicopter. For example, you could buy a ready-to-fly copter, such as the popular DJI Phantom (Available here for $999.00) which does not require much (or any) assembly. You could also build all the way from scratch by designing and engineering your own airframe and electronics. On this wiki page, we present a list of parts for building a custom multicopter from off-the-shelf parts. This kit requires some moderate assembly, but is low cost, flexible, and easy to modify. This is not as complex as a "build from scratch" kind of thing, it's more like a "Hot Rod" approach to multicopters. Take some cautions before you get started with this project. Most of the parts listed here are hobby-grade and manufactured cheaply in other countries. So in short, don't expect warranties, safety certifications, or even instruction manuals in English. Also, check to make sure it is legal to fly in your location, be mindful of safety, and please don't be a nuisance. These are experimental, home-brew aircraft, so please take the appropriate precautions. 3DRobotics PixHawk - This control board is the most popular for applications involving autonomy. It has a reasonably fast 32-bit microprocessor, a realtime multithreaded operating system, and much more input/output (e.g. CAN bus, SPI, etc). This autopilot is recommended for users who have robotics and software development experience and want to do stuff like using DroneAPI to develop custom code in Python to control the UAV, develop custom robotics algorithms, do more sophisticated sensor processing, or integrate the autopilot unit with another control board. You might also be interested in it just because it's the latest-and-greatest open source platform. Either way, it's a little bit more expensive and requires more experience to set up than other options. 3DRobotics - about $199.99 bare, about $79 for GPS and about $100 for Telemetry. Clones of the PixHawk have shown up in-the-wild, e.g. at GoodLuckBuy and even at RCTimer YMMV - these clones are not well tested yet and may be an inferior product. However, at almost half the price, it might be worth a try. DJI NAZA - If smooth and stable manual flight is your number one priority (e.g. an aerial video workhorse), but you don't care about things like waypoint missions and programmability, then the NAZA is an excellent choice. NAZA is uncomplicated, easy to fly and tune, and has reliable position-hold and altitude-hold characteristics. It doesn't have as many features as the open source flight controllers, but you can count on it to perform mostly as advertised. To give a computing analogy, if ArduCopter/PixHawk is the "Linux" of multicopters (open source, flexible, DIY), then NAZA is like the "Windows" of multicopters (plug and play). NAZA-M Lite - Available for $169.00 from IntelligentUAS including GPS. NAZA-M V2 - Available for $299.00 from IntelligentUAS including GPS, iOSD and BTU accessories. Naze32 - This is as minimal, small (36x36mm), and inexpensive as it gets. Naze32 is for those who just want to fly manually and eschew complexity, weight, and size. This is popular among FPV racers and has a great GUI program to configure it. It generally does not have the fancy features like GPS hold, waypoint missions, etc. GetFPV Afromini Amaze rev3 - $24.99 - Extremely tiny version weighing only 1.75g! For NAZA and PixHawk: These usually come with a power module, you usually will not need an extra one. For Naze32: You need a BEC rated at 3A or more. (A BEC is just a switching DC-to-DC voltage converter). It should cost < $10. RCTimer - Costs only $2.99! 3DRobotics - For APM. Costs $24.99 but comes with a voltage and current sensor that you can plug into the APM. This allows you to program a low-voltage failsafe, etc. Here's some recommended configurations. There's so many tradeoffs here, the perfect multirotor for you will depend on a lot of factors. If you have a question, please do ask in the forums. For a beginner, a small quadcopter is smaller, safer, less expensive and easier. Robots break, so consider getting some less expensive first, then upgrading when you're ready for more. The DJI Flame Wheel style frames (used in the "Small" configurations shown below) are recommended because they're cheap, durable, amenable to many applications, and easy to modify. See later sections of this document for propeller and battery recommendations. Note: The 20 min flight time is calculated based on using two 6000mAh 6S batteries and 15x5 CF props, with an AUW of 6780g. So it may be suitable for carrying something like a Panasonic GH4 with DJI Zenmuse Z15-GH4 (HD) Gimbal. Not recommended for newbies. It is highly recommended that you consult with an expert or gain experience with a smaller vehicle before you invest in one of this scale. You can also consider alternative frame designs such as the TBS Discovery. The TBS Discovery frame is designed with swept back arms so that a camera can be mounted in front and a battery can be mounted in rear. What's cool is that this frame uses the same arms as the RCTimer and DJI frame kits shown above, so you can upgrade from your old RM450 or F450 frame easily. Be careful. Lithium Polymer batteries that are typically used in radio control hobby aircraft like these are more hazardous to handle than regular batteries you may be used to. Always buy reputable brands (look for recommendations from other users) and make sure you read warning labels and follow safety procedures when using these types of batteries. This is what happens when you don't use the right settings on the charger. Quadcopter: 5000mAh 3S 25C from HobbyKing ($27.02), OR IntelligentUAS ($45.00). This particular battery is the largest that will fit inside the quadcopter. If you would like to use a larger battery, it will have to be mounted on top or on bottom of the copter. You can use smaller, lighter batteries if you would like, I recommend something in the range of 2200mAh to 5000mAh 3S. The expected flight time of the kit quadcopter with this battery installed (no additional payload) is about 20-25 minutes. Flight time could possibly be improved with slower, fatter motors (700KV or so), at the expense of agility. Flight time is dependent on many factors (environmental factors such as ambient temperature, air pressure, etc); this is just a ballpark estimation. YMMV. The F550 hexacopter frame is designed so that the battery is supposed to sit on top of the copter; the flight controller goes inside the copter. The flight time with the kit hexacopter with this battery installed (no additional payload) is about 10-15 minutes. Another option instead of the big 4S battery is to use 2 3S batteries in parallel. For example, it is common to use 2x 4000mAh 3S 20C batteries in a hexacopter. It's more complicated (because of having to deal with multiple batteries) but can provide longer flight time. For multiple batteries in parallel, we do recommend charging them in parallel and also using a parallel balance cord. 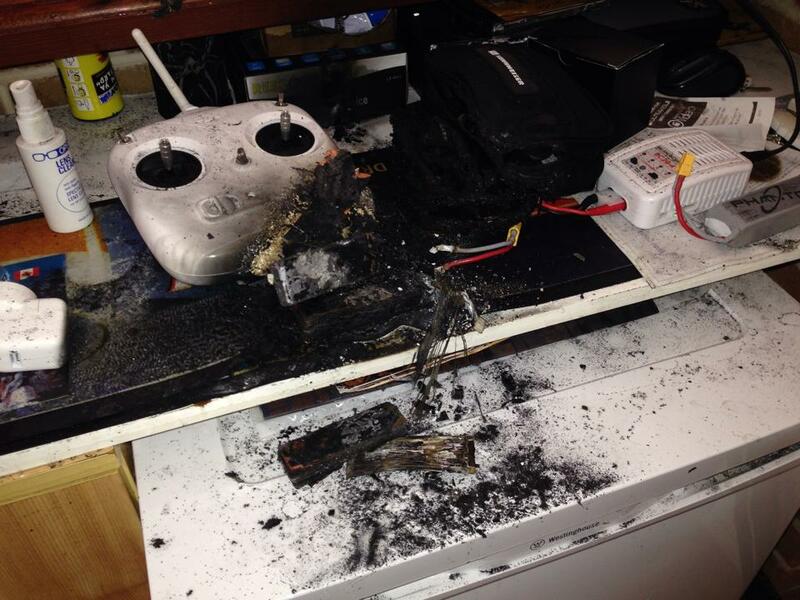 Let us know and we can advise you of the correct procedure for charging and hooking up parallel batteries. It's said that a 2x 5000mAh 3S 20C configuration can give you a flight time of 20 minutes. As always, flight time varies depending on configuration and other factors, these are ballpark estimates. YMMV. Fireproof Lipo Charging Bag (HobbyKing $4.17, RCTimer $6.59) - It's a sack made out of fireproof material. You can put your batteries in here while charging to help contain fires if they occur. They're inexpensive but could save your house from burning down. Recommended for first time users: X100 charger. Has a touch screen, 32 bit processor, and supports up to 8A charge. Unfortunately not available in the USA warehouse yet, so it might take awhile to ship. HobbyKing ($49.99), plugs directly into US outlet no need for additional power supply unit. Turnigy Accucel-6 is also a good charger at a good price for 2S-6S batteries, and is available from the USA warehouse. HobbyKing ($24.10). See below notes. You will also need a power supply unit for it that supports at least 72W at about 11-17V. You could buy the HobbyKing 350W Power Supply ($43.94), which provides more than enough power at a reasonable price. It doesn't come with a power cord, so you will need to get a power cord with a mickey plug. You could make a bench power supply an old ATX power supply unit from a PC (solder the green and black wires on the ATX connector together to force it to turn on). These type of power supplies usually provide nice stable power, but usually have tons of wires hanging out, so it's not pretty or compact. There are several reputable manufacturers of props: DC DUG users report that GemFan and APC are good brands. Graupner E-Props are excellent, but costly (and overrated). Below is a listing of props that are known to work well with the motors listed above. 10" Carbon Fiber from RCTimer - ($23.99 for a pack of 4 pairs) very durable, but requires some balancing. 10" ABS from RCTimer- inexpensive ($19.99 for a pack of 12 pairs), good for testing and learning to fly, will require balancing. Choosing one of these is like choosing a car. There are many different brands and models. A cheap one will get you from point A to point B, but investing in a good one is a better idea in our opinion. Five or more channels. Generally, the first four of channels are the output of the two joystick gimbals on your transmitter. They control throttle, yaw, roll and pitch. You would assign the remaining channels to the switches on your transmitter, and use those to control functionality on the flight controller such as flight mode, tuning, orientation control, etc. Mode 2. Most pilots in North America are flying on Mode 2, which mimics the layout in a full scale airplane (Aileron and Elevator in right hand). Based on modern wireless modulation standards that are resistant to interference, such as DSMX (Spektrum), FASST (Futaba), ACSST (FrSky), AFHSS (Hitec), or HoTT (Graupner). Most of these radios are using some form of hybrid frequency hopping spread spectrum (FHSS) to constantly hop between channels to prevent collisions between your signal and the signal of other users on the band. Best bang for buck - Turnigy radios, or FrSky Taranis. These are upgradable, modular transmitters, meaning that you must install a radio module inside them to use them. They have the most functionality per-dollar of any RC transmitter on the market. Turnigy 9XR - from HobbyKing International for $50.22 - firmware is open source and entirely customizable, and it supports many different transmitter modules. Combined with FrSky transmitter / receiver modules, the functionality provided by this system is on par (if not better!) some of the more expensive options. There's also a 9XR Pro version out, which is a little bit more expensive but has some more features. Recommended transmitter module: FrSky XJT ACCST module available from Aloft Hobbies. Recommended receiver module: FrSky D4R-II ACCST module available from Aloft Hobbies. Small and outputs PPM, allowing a clean single-wire connection to the APM, PixHawk, NAZA, or OpenPilot. It also supports telemetry! Turnigy 9X - HobbyKing USA for $69.97 or HobbyKing International for $59.99. The 9X is the predecessor to the better 9XR. The reasons to get the 9X instead of the 9XR is that it is slightly cheaper, easier to find in-stock, and comes with a module and receiver, whereas the 9XR requires you to buy the module separately. Blend of compatibility and function: Spektrum DX8 (~$300 transmitter only from Amazon). A Spektrum DX7s (Amazon) would also do fine. The main advantage of Spektrum is the wide availability of compatible products, such as low-cost OrangeRX receivers, and many ready-to-fly models at Horizon Hobby including the Blade QX series quadcopters. Tip: Use DSMX, which is vastly superior to DSM2. If you are using a Naza or PixHawk or OpenPilot, an OrangeRX receiver that supports SBUS can connect directly to the flight controller with a single wire. Otherwise, for single-wire connection will need some sort of SBUS to PPM converter, or you will need to use standard per-channel PWM connection. Best investment for more serious user - Futaba radios. These have an excellent user interface and ergonomics, and use robust, well-respected wireless technology, from a company that's been making electronics since the 1940s. Futaba T10J from IntelligentUAS - 10 channels, telemetry, voice output for $369.00! Careful though, it uses Futaba FHSS instead of FASST so make sure you get a compatible receiver! Futaba 14SG from IntelligentUAS ($649.00) or Amazon. Modern, reliable transmitter with an excellent user interface and support for telemetry. Futaba T8FG from Amazon, which is about 1/2 the price and is also 14CH, but lacks built-in telemetry. Note: Futaba receivers with SBUS are generally preferred for Naza, or OpenPilot, however, some great receivers for Futaba FASST are FrSky modules such as the TFR4-B (Available at Aloft Hobbies) which get the same range as a Futaba brand receiver but with a smaller form factor, significantly lower cost, and 8CH PPM output capability. Minimal radio (just enough to get started): OrangeRX T-Six - 6 channels, DSM1 and DSM2 support. If you are using an APM or a PixHawk and it did NOT already come with a data link or "telemetry" radio, you will want to purchase one. Even if you are not going to use it in-flight, it comes in supremely handy for configuration and tuning. 3DRobotics - $, but comes with a case, each device is transceiver (they can be used as either the transmitter or the receiver), comes with the USB cable for use with both PC and mobile phone/tablet, and uses Hirose DF13 connectors more amenable to genuine 3DRobotics stuff. If you are using OpenPilot it comes with the telemetry on-board, but it is 433 MHz which is not FCC legal unless you have a HAM license. Unfortunately you will have to wait for the 915 MHz version of OpenPilot if you want to use it legally in USA. You can also use your RC transmitter's telemetry features if it has them. For example, Spektrum sells a variety of telemetry equipment that you can use to get real-time status of your copter relayed straight to the RC transmitter. For many applications (such as those not requiring mission planning) this is more handy than having it relayed to your PC. Check whether your particular RC transmitter supports telemetry. Servo wires - you need these to connect your radio receiver. These are available from various sources, most hobby shops have these. You can buy a crimp tool and make your own wires out of premium servo wire (as cheap as $0.99 per meter!) and crimp pins. Having a crimp tool is very, very handy in all of robotics, where you deal with 0.1" header pins a lot. They're on Arduinos, Raspberry Pis, RC Servos, you name it. Crimping ain't easy, but it's necessary. You can get wires with pre-crimped terminals and insert them into 0.1" housings. This is the easiest. Saves you time, even if you have a crimp tool. Battery connectors - choose a battery plug type and stick with it for most of your drone stuff. Anderson PowerPole PP45 connectors - reliable, clean looking, and crimp-based (soldering not required, but you do need a crimping tool). Note that "amp rating" for the PowerPoles is based on 120VAC, so a 45A powerpole can handle 5400W. EC5 connectors (essentially 5mm bullets with a standarized blue housing), ($14.99 / 10). Cheap and handles the load, but really hard to unplug sometimes. Anderson PowerPole PP75 for 6, 8, or 10 ga wire. Anderson PowerPole PP120 for 2, 4, and 6 ga wire. Battery leads: You will need a short length of 10-12 AWG wire. Silicone-coated wire is the best. RCTimer sells some pretty cheap in Red ($2.66 / m) and Black ($2.66 / m) by the meter. Wire connectors: The most standard wire-to-wire connector for 12-16 AWG wire (like that used on the motors) is a 3.5mm bullet connector. You can get some cheap at RCTimer, you will need Male ($2.99 / 10) and Female ($2.29 / 10) ends. Heat shrink tubing: For connections using 3.5mm bullets you should use 4mm heat shrink tubing. You can get them in Black ($1.23 / m) and Red ($0.35 / m) at HobbyKing by the meter. You can also get variety packs of heat shrink tubing (Amazon). Vibration Isolation Gel - This material should be used to isolate the flight controller from the vibrations caused by the motors and propellers. See this page for more details about vibration and how to deal with it. As noted on that page, the single easiest solution is to use Kyosho Zeal Gel (Amazon for ~$14), which is a thick sorbothane gel with sticky adhesive on both sides. Set of metric hex screwdrivers and metric hex socket drivers/wrenches. In particular, you need a good 2mm hex screwdriver (for the RM450 frame's M3 screws) and a good 8mm hex socket driver or wrench to install propellers onto the HP2212 motors. Soldering iron - A crucial tool for electronics work. Avoid generic soldering irons. You want one with a brand name so that you can replace the tip if you need to in the future. Temperature controlled iron is best, but a standard 40W will do. Micro USB A male to micro B cable - like the kind you use to charge most smartphones. Prop Balancer - HobbyKing has a few, but you can also find them on Amazon. You will want one of these this to balance the propellers and reduce vibrations. These are recommended tools, but you could live without them. Simulator and Learning tools - You should learn to fly before you crash your expensive investment. AeroSimRC and PhoenixRC are great simulation packages, with tutorial lessons for multirotor aircraft built in! Estes ProtoX Nano Quadcopter - An extremely small, and cheap ($40) ready-to-fly toy quadcopter. Flying this around can help you get the hang of the fundamentals of flying a multirotor, in particular: getting used to orientation and sensitivity of the sticks. It's hard to break it, and it's mostly safe around kids. Syma X1 - Another very small quadcopter, for about $30 which is very stable. The included controller is very dumb, but if you have a Turnigy 9X or 9XR with FlySky module, you can bind to it and fly it more realistically. Some of the vendors take longer to ship than others. Please take this into account when you are ordering! RCTimer takes about 2 weeks to deliver to EST time zone using HK Post ($2), but very fast 3-5 days using DHL (but express shipping can be expensive depending on the weight of your order. For one quadcopter, expect shipping cost to be about $40). Do not order from UAVObjects, one of the RCTimer dealers in the USA. We have been sent more than a few reports about UAVObjects from fellow users of bait-and-switch tactics, shipping faulty products, poor customer service, and order manipulation. HobbyKing takes about 3 weeks to deliver from international warehouse (maybe longer). If an item is out of stock in your order it could take 5 weeks to receive your order! USA Warehouse items cost slightly more but usually delivers in 6-8 business days, express USPS shipping is available. BE CAREFUL not to order twice, their web site is slow sometimes and refreshing during the order process WILL duplicate your order. 3dRobotics shipping time is usually very fast (6-8 days), so long as the parts are in stock. Feel free to ask in the DC DUG Forums whether other members have parts or tools for sale!